The harsh beauty of the Outer Hebrides is a landscape that has lured many photographers, yet the latest of those to explore the islands was not there to photograph the views, but to document a manufacturing industry that is known around the world. Lara Platman spent seven months on the islands following the production of Harris Tweed, from the backs of the Blackface and Cheviot sheep to the suits on sale in Savile Row. Harris Tweed has a rich history that stretches back to 1864 when Lady Dunmore, the widow of the Earl of Dunmore, had the Murray tartan copied by Harris weavers in tweed. The resulting cloth proved so successful that sales spread from the local area to a number of the major towns in the UK. Improvements to the process and the development of new looms saw mills being opened in the early part of the 20th Century, and by 1911 the Harris Tweed Orb stamp, a mark of certification, could be seen on genuine products. 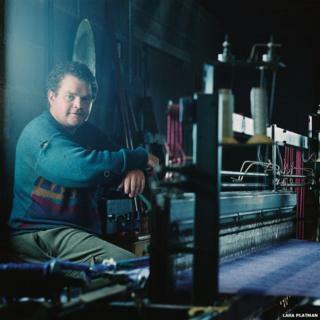 Though there were a number of challenges to the definition, by 1993 an act of parliament declared that the Harris Tweed Authority was the owner of the Orb: "The Harris Tweed is cloth that has been hand-woven by the islanders of Lewis, Harris, Uist and Barra in their homes, using pure virgin wool that has been dyed and spun in the Outer Hebrides." Today there are some aspect that are mechanised yet it remains true to its roots, with weavers working at home, sometimes in sheds attached to their crofts in the hills and villages. Harris Tweed has known tough times, but the past couple of years has seen new weavers coming online and very healthy growth figures, due in part to its expansion into new areas. Though the tweed is still primarily associated with high-end clothing and is a regular on the fashion catwalk, it is also now used in many other products, such as upholstery, bags, lampshades and, if the mood takes, corsets. Lara's project coincided with the 100-year anniversary of the Orb mark being registered and is a fitting tribute to both the past and the present workers of tweed. She was drawn to the project by the sustainable nature of the process, one that gives each member of the chain a living. "While making my previous book, Art Workers Guild 125 Years: Craftspeople at Work Today, I met a few weavers and thought that these people have amazing patience," Lara told me. "With sculpture you can see it form in front of you, photography is instant and in architecture there are plans, but weaving is just one line at a time. It's an art form rather than an industrial process." "Yet I was aware that there was a danger of producing a tourist view rather than the real picture. So that is why I spent as much time as possible up there and experienced all the seasons, though I managed to hit the worst winter for many years, some of it while I was camping out." As the seasons changed it became clear to Lara that there was a relationship between the landscape and the fabric. Similar patterns and tones can be seen in Lara's close ups of heather and gorse as well as those of the finished rolls of tweed. Lara said: "The whole idea of the wool is to mash it up like a candy floss machine, then it is pulled and teased in the carding machine, so for example you might get an orange thread that has stayed there all the way through the cloth. Every piece of cloth is individual despite the fact that they follow recipes. It is a commercial business and this means they can match up historic patterns." The project has been published by Frances Lincoln and result is part history and part snapshot of the industry and those who continue the tradition. "I deliberately did not want a book solely of portraits, so it's a mixture. It's also important to see where they live and how the landscape is reflected in the product." Harris Tweed: From Land to Street by Lara Platman is published by Frances Lincoln. You can hear more from Lara about the work on Woman's Hour.